This compact, contained device comprises piezoelectric crystals and a compression trigger mechanism to create a steady stream of ions from the tip. 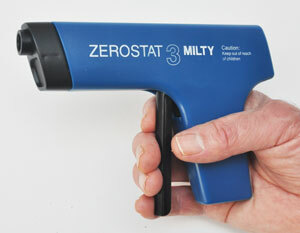 The Zerostat3 Anti-Static Gun creates both positive and negative ions in a complete cycle. When the trigger is squeezed, positive ions are released. When the trigger is released, negative ions are created. This functions allows to either induce a positive of a negative charge. To reduce a negatively charged surface or object, point the Zerostat to the surface and squeeze the trigger, then point the Zerostat away when releasing the trigger. To induce a negative charge on a surface, point the Zerostat to the surface when releasing the trigger. The static reduction effect can last for hours. The Zerostat3 Anti-Static Gun has numerous applications such as keeping phonograph records, film or CDs, DVDs, lenses, glass, displays static-free, dust-free and lint-free. It also works very well for removing static charge when handling TEM grids, preparing SEM samples or removing dust from samples. Other applications are chemical labs handling powder samples to reduce static charge on (weighing) containers. The Zerostat does not contain batteries or any replacement consumable parts. 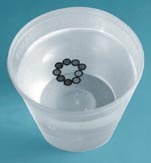 The Zerostat does not use a forced gas stream. The lifetime of the anti-static gun is approximately 10,000 cycles and needs to be replaced when the it doesn't generate antistatic charges. Small handheld unit with a weight of 135g (0.30lbs). Staticide® is an easy to use topical antistatic solution which can be sprayed on virtually any surface to reduce static charging. It is easily applied on work surfaces, lab benches, chairs, walls, floors, tools, clothing and other materials. 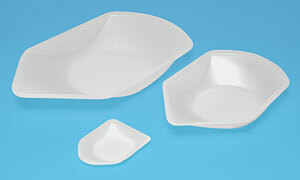 The product is non-staining, but we do advise to test first before applying to sensitive surfaces. The antistatic effect last from weeks to months. It prevents static before it builds up and keeps work areas dust-free. Available in 4 or 32 oz (1qrt.) spray bottles and as wipes. 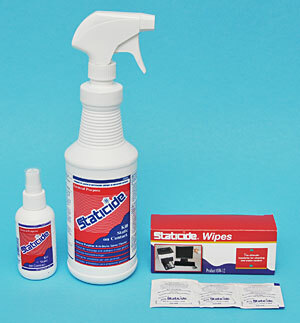 The wipes are particularly useful for keyboards, monitors, instruments and equipment where a spray might interfere with sensitive parts such as lenses or electronics. Although it can eliminate charging on non-conductive samples, we do not recommend this product for use on non-conductive samples for imaging in the SEM.